Here's another easy recipe. Add another twist to puto and siopao. 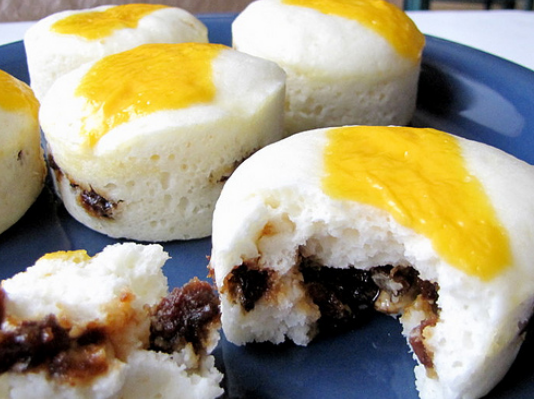 Make the popular puto pao. Puto and siopao are great for snacks, and as a business, they require minimal capital and are easy to make. 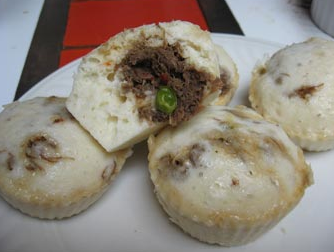 This time, we’ll teach you how to make puto-pao, a bun with asado toppings or fillings. You‘ll need the following to get started: bowls, ladle, wooden ladle or whip, spatula, measuring spoons and cups, kitchen weighing scale, serving tray, pressure cooker or casserole, wok or skillet, steamer, knives, and gas stove. You can buy the ingredients at the supermarket or public market; the rest you’ll probably already have in your own kitchen. So the meat won’t become crispy, don’t sauté or braise it. Cook it only in water and soy sauce. Let the meat absorb all the liquid until it dries out. After that, turn off the stove and set the cooked meat or asado aside. This asado can fill four sets of your bun recipe. Let it cool and start doing the buns. 2. Get all the dry ingredients and mix them in a bowl. Then add water. Using a wooden ladle or whip, dissolve all the ingredients. Continue mixing them until you achieve a smooth texture. Make sure all the lumps are dissolved. Then add the melted butter (you could also use cooking oil as an alternative). Mix. You’ll know when the mix is ready for steaming when there are no lumps left. 3. Afterwards, get the ounce-size molds. Pour in the mixture until each mold is three fourths full. Then put one teaspoon of the asado on top. If you want to make it a filling, then fill the mold a quarter full and put one teaspoon of asado. Then pour in the mixture until it’s almost full. Arrange the molds in the steamer, which should contain enough water. Steam for 30 minutes in boiling temperature. 4. Make sure there’s enough water to steam your puto-paos. After 30 minutes, take off the puto-paos from the molds. Your yield for this set should be 48 pieces, which by then should be ready to be served with other merienda treats. Josie de Jesus, lecturer at the baking division of Ultima Entrepinoy Forum Center, advises that you shouldn’t re-steam puto-paos repeatedly. Once re-steamed, they should be consumed at once, she says. Otherwise, the quality and taste of the putopao deteriorates and it becomes prone to spoilage.